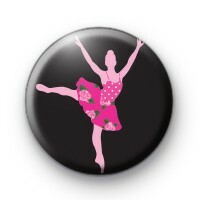 An amazing ballet dancer badge in black featuring a ballet dancer wearing a cute floral skirt and polka dot leotard. If you know someone that loves to dance or teaches dance/ballet this would be a cute badge for them. We have a good range of ballet/dance/drama inspired badges so have a search or check out the categories to the left. 25mm badge made in the UK. Would just like to say.. wow was very impressed with the service and quality of the badges I received. Thank you.